Looking for a way to outperform your competitors and adjust your SEO strategy effectively? This competitor analysis tool will help you fetch valuable data and SERP information needed to succeed. Gain access to an all in one data solution for all you want to know regarding your competition. There are six major information categories that allow you to understand and take precise actions towards enhancing your online business strategy. These data categories include Basic Competitor Data, Top Ranking Keywords, Referring Pages, Social Pages, and more. Learn about all the fundamental information that concerns your targeted competition with just a click of a button. 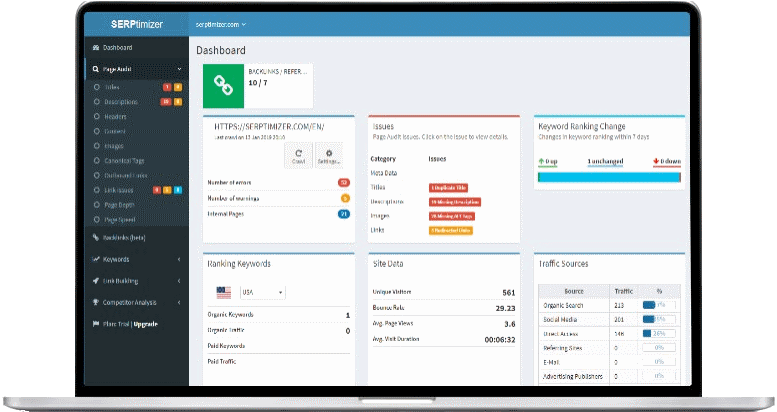 With this tool, you will be able to know the number of Visits, Bounce Rate, Page Views and Average online time per visitor (Time on site avg.) that your targeted domain has. The competitor data analysis tool gives insight regarding the traffic sources of your targeted domain. You get to know how much traffic was generated via Direct Access, Organic Search, Social Media, Referring Pages, Paid Search, Email and more. The referring pages display the domains that have served as referrals to your competitor’s domain. It also shows the amount of traffic each domain was able to pull for the targeted domain and their percentage impact. With this, if you are looking for domains to refer your product, you can decide better which to approach. The Social pages feature allows you to discover which social platform your competition utilizes for traffic. With this competitor data analysis tool, you can glean accurate insight about the social sites’ percentages and garnered traffic. This way, you know the media outlets to prioritize in your social media marketing strategy. With the Competitor data analysis tool, you will have listed in the top keyword category five of the highest lead generating keywords of your competition. Along with these keywords, the tool provides you with the amount of traffic they have generated and their percentage impact. Get to know the top five countries that brought the most traffic to your competition. This list will hold the percentage impact as well as the amount of traffic generated by them. This way, you can have an idea of which countries to focus on regarding your preferred keywords and products. Gain more insight into your competitions. With this unique tool, you can obtain keywords Ranking Comparison between two or more competitors. The Competitor SERP’s tool showcases the position, title, URL, and description of the search results for each keyword. Can be used for optimization of the CTR – Click-Through-Rate.